remove the starter relay. 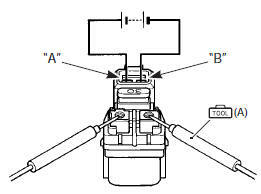 Refer to “starter relay removal and installation” . Apply 12 v to “a” and “b” terminals and check for continuity between the positive and negative terminals using the multi-circuit tester. If the starter relay clicks and continuity is found, the relay is ok.
do not apply battery voltage to the starter relay for five seconds and more, since the relay coil may overheat and get damaged. Measure the relay coil resistance between the terminals using the multi-circuit tester. 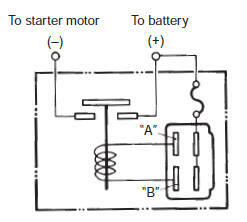 If the resistance is not within the specified value, replace the starter relay with a new one. Install the starter relay. Refer to “starter relay removal and installation” .